The Maryland Department of Natural Resources announced today that deer hunters reported harvesting 10,008 deer on the opening weekend of the 2018 Maryland firearm season, a decline from last year’s official total of 13,622 deer for the same period. Significant rain across the state Saturday was largely responsible for the decrease. The total includes 5,501 antlered and 4,507 antlerless deer, with sika deer comprising 205 of the antlered and 203 of the antlerless totals. 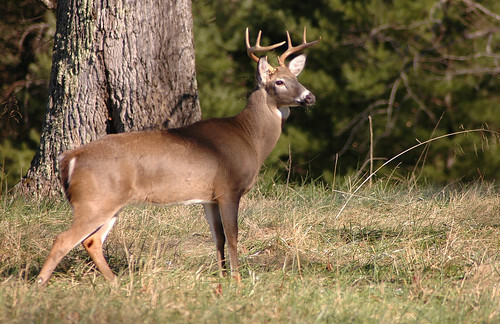 The two-week deer firearm season runs through Dec. 8. Hunters in Region A (western Maryland) reported harvesting 1,147 deer, down from last year’s harvest of 1,458. In Region B, the antlered deer harvest decreased from 4,856 last year to 4,354 this year, and the antlerless harvest decreased from 7,308 to 4,507. Deer hunters harvested 3,787 deer (1,897 antlered; 1,890 antlerless) Sunday, up from the official total of 3,395 last year. Hunting is permitted on select Sundays in 20 counties and has become increasingly popular with hunters across the state. Frederick County led the Sunday harvest with 470 deer taken. Junior hunters tolerated a windy Saturday to take 2,163 deer during the Junior Deer Hunt Days, down from the official harvest of 2,465 last year. They registered 1,454 antlered and 709 antlerless deer. Hunters are encouraged to consult the Maryland Guide to Hunting & Trapping for additional changes to bag limits, regulations and registration procedures.During firearm season, Maryland requires deer hunters and their companions to wear daylight fluorescent orange or pink in one of the following manners: a cap of solid fluorescent daylight orange or pink; a vest or jacket containing back and front panels of at least 250 square inches of fluorescent daylight orange or pink; or an outer garment of camouflage daylight fluorescent orange or pink worn above the waist and containing at least 50 percent daylight fluorescent color. Maryland hunters are encouraged to donate any extra deer they may harvest to Farmers and Hunters Feeding the Hungry. New this year, hunters may claim a tax credit of up to $50 for each legally-harvested deer that is processed and donated to a nonprofit food sharing program. The maximum credit in any one tax year is $200 per hunter. The approved form to claim this credit is available online.